I became a fan of of science fiction artist Richard Powers without knowing it. As a teenager I read a lot of science fiction and much of it was in the form of inexpensive paperbacks from the 60’s that I would come across in used book stores. While there were a number of cover artists for these books that I enjoyed, there seemed to be two major styles. 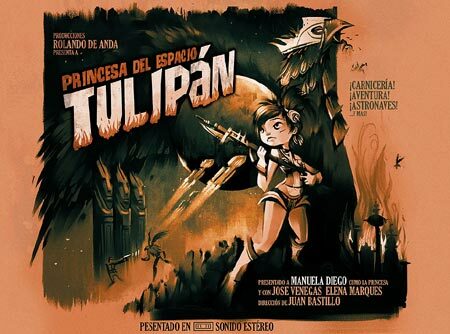 One was the straightforward style that involved a more or less realistic depiction of spaceships, robots, alien landscapes (that usually looked like the rocky parts of the American West for some reason) and adventurers in spacesuits. Some cool and fun stuff, but pretty much what you would expect for an art style that evolved out of the wonderfully lurid pulp covers of the 40’s and 50’s. The other style was… something else. There was a fair bit of variety within this second style, just as in the first, and even though it often appeared on the covers of books from certain publishers (Ballentine and Ace), I assumed it was the work of several artists who were just out on the fringe of the science fiction cover art, or else were all actually sending in the work from beyond the moons of Jupiter. I didn’t realize at the time that they were pretty much all the work of one artist. Richard Powers started with a more conventional science-fiction style, painting the usual spaceships, aliens and women in other-worldly distress, but like someone whose mind has been invaded by the tendrils of an alien intelligence, his work started to get stranger and stranger, eventually dropping almost all pretense at representing normal science fiction subjects and evolving into a style somewhere between non-representational and the realistic depiction of unrecognizably strange objects. Powers was, in fact, under the influence of bizarre alien intellects – he had discovered Surrealism. 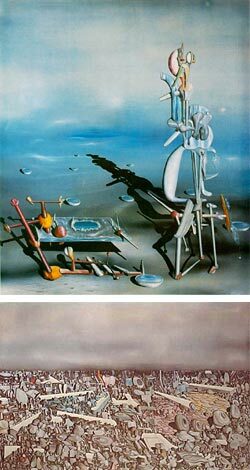 His work shows the wonderfully strange impact of the dream and subconscious inspired work of Surrealist painters like Max Ernst, Paul Klee, Joan Miro and, in particular, Yves Tanguy. Unfortunately, I can’t point you to a grand repository of Powers art on the web, so I’ll have to give you scattered links to some modest galleries, bios and articles. There is a collection of his work, The Art of Richard Powers by Jane Frank (from Paper Tiger, with an intro by Vincent Di Fate) that is out of print, but available from used book sources or through Amazon. Thanks to Jack Harris for links and info. When I profiled Chris Turnham and his fresh, lively illustrations and concept art back in January, he immediately wrote me and suggested I check out his friend and fellow illustrator Kevin Dart. Kein Dart’s site is arranged as a blog with links at the top to a Gallery, About page and some Extras, including some photo journals, a tutorial and two slideshow style animations of his drawing process. The Gallery contains real book covers as well as some made-for-fun book covers and movie posters in which Dart indulges in his obvious affection for 60’s modern style movie posters and paperback covers. There are also some sketches and a short CGI animation called Gertie Gutless. Dart’s jauntily stylized characters and abstracted backgrounds are a nice counterpart to Turnham’s stylish renderings. Turnham and Dart have a created a collaborative site to sell prints of their work called Fleet Street Scandal that has galleries from both artists. Seung Ho Henrik Holmberg is a concept artist who has worked for gaming and entertainment companies like The moving Picture Company, PDI/DreamWorks, Industrial Light and Magic, Chimney Pot and Streamline Studios. Many concept artists will put a bio on their site the makes it sound like they simply fell out of bed and into a plush job working for glamorous film studios, glossing over any difficulties reality may have placed in their way (and who knows, maybe some of them had an easy time of it). Holmberg (who signs his work “Seung Ho” – the wonderfully unusual name comes from the fact he was born in Korea and adopted by a Swedish family at 13 months) is remarkably candid in his bio about the fact that his career path was not easy, and as such should be inspirational to others who feel they are struggling inordinately. Seung Ho draws concept sketches in marker, ink and paint and often goes to color in Photoshop. He has a facile command of both digital and traditional media and uses both with a sense of what is appropriate to the illustration task at hand. His site features a variety of concept art, matte painting, and CG painting as well as sketches and studies. 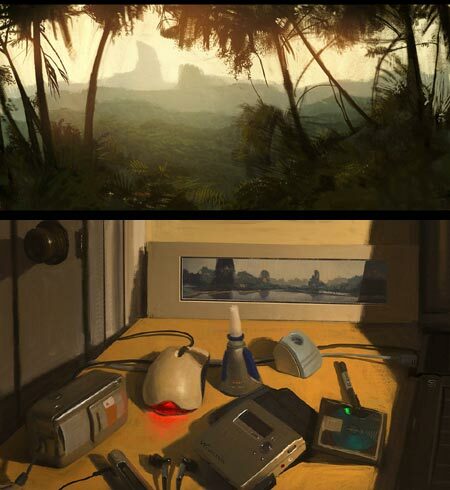 As much as I enjoy his professional work (love the concept designs for that wonderful dinosaur and caveman FedEx SuperBowl ad), some of my favorites are the “speed sketches” (image above, top) and digitally painted studies of ordinary rooms and objects.